Trevor and I got married in the Albuquerque Temple in 2003. We met at church, and were two out of three singles in the entire ward at the time. Neither of us thought we'd meet anyone during our time there. But, it only takes one. 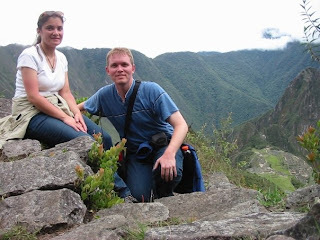 This picture was taken while we hiked Machu Picchu last fall. We went with my parents and a tour group, and this day was also my 32nd birthday. Together, Trevor and I have also traveled to Argentina (where he served his mission), southern Mexico, Costa Rica, and the UK (where I lived for five years). We both love to see new places and we try to get somewhere Spanish speaking once a year so that Trevor can stay bilingual. Me, I'm slowly getting to the point where I'll try to converse in Spanish.